America the Beautiful Quarters took center stage Wednesday when the US Mint announced the new program to an awaiting public. With a ton of fanfare about the list of national parks and sites the new quarters will feature, it was easy to miss the Mint’s same-day introduction of the America the Beautiful Silver Bullion Coins. But before reviewing these silver coins, an understanding of the new quarter series is important. America the Beautiful Quarters will feature up to five new designs each year beginning in 2010 and lasting to 2021. The eleven year series will result in 56 circulating quarter-dollar coins with reverse designs emblematic of a selected site in each state, the District of Columbia and U.S. territories — Puerto Rico, Guam, American Samoa, the U.S. Virgin Islands and the Northern Mariana Islands. "These new quarters will honor some of our most revered, treasured and beautiful national sites — majestic and historic places located throughout the United States and its territories that truly make us ‘America the Beautiful,’" said United States Mint Director Ed Moy. 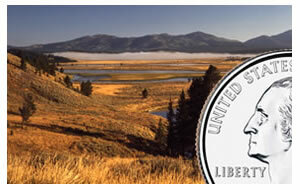 America’s Beautiful National Parks Quarter Dollar Coin Act, which authorized the new series, also mandates that the US Mint strike "exact" silver bullion "duplicates" of each quarter, and thus was born the America the Beautiful Silver Bullion Coin Program. Their diameters will be twice the size of early US silver dollars, like the Morgans, and nearly double that of today’s American Eagle Silver, which is 1.598 inches in diameter and includes one ounce of silver. For silver coin collectors and investors, this new program looks to have both its pros and cons. The thought of a super-sized US coin can certainly be daunting. Some seasoned numismatists are less than thrilled with the new program. Numismatic News Editor Dave Harper summed up the feeling of many coin collectors in an article entitled New U.S. bullion coins; who cares? "I think the whole thing makes a joke of American coinage, but then the solons in Congress thought otherwise and tucked the provision into the quarter bill. Will bullion investors flock to it? Why would they do so? The American Eagle is so much more widely traded and recognizable." On the flip side, the series may open up new avenues for investors and bring the hobby news collector. How will the younger generation feel toward the bullion coins? That is key. Only time will tell. The silver coins will follow each quarter release. Here is a list and release dates compliments of America the Beautiful Quarters Release Schedule. The National Site Registry list is also available from the US Mint at http://www.usmint.gov/mint_programs/NSQuartersProgram/?action=siteRegister. Wonder where the silver went last year for our Proof Silver Eagle Program? The five ounce A.T.B. Bullion act was similiar to rolling the dice on a crap table. Why not continue with a cherrished item such as the Proof American Eagle ?? Why gamble with a sure thing ?? Thank you, Brett from Oregon.